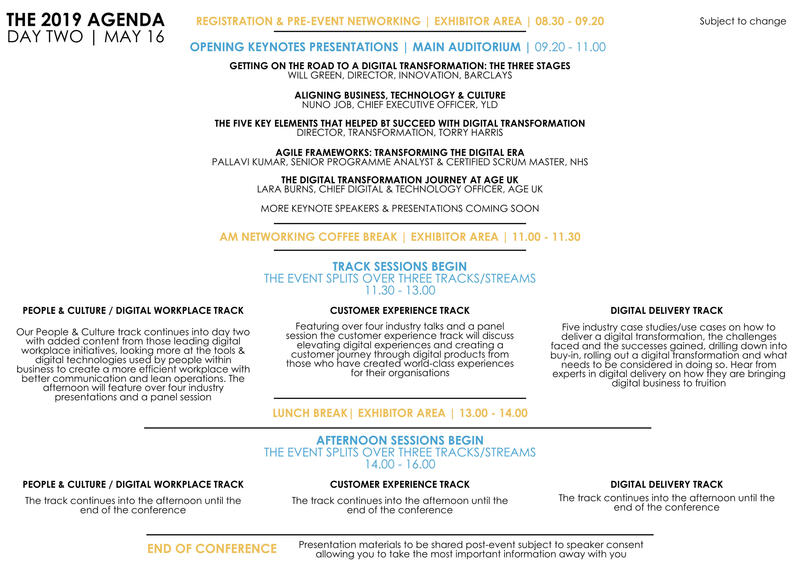 Featuring over 40 sessions throughout the two days, seven different tracks, extensive networking sessions and a chance to pose questions to our speakers The Digital Transformation Conference is the ideal environment to gain insights and understand real business cases whilst rubbing shoulders with some of the brightest digital business minds. More speakers announced every week up until the event. Our final speaker line up will consist of over 40 industry speakers working in all facets of digital business transformation across our keynotes and streams. For further information on speaking please contact Chris Towers. Below you can view our initial agenda, with some more keynotes to be added and our speakers to be allocated tracks the agenda promises great content of case studies, challenges faced, successes made, implementation lessons, insights and trends from some of the most forward thinking digital practitioners in the UK and Europe. The tracks will feature the above speakers across the two days. The agenda is subject to change. For any more information on the two days please contact us. The 2019 Conference will open with our esteemed keynote presentations & keynote panel session. Some very big names share insights into some of the biggest transformation projects in the country. People first. Technology comes second, a sentiment often echoed at enterprise tech events. We explore the importance of people & culture in business transformation. Technology is changing the way the way we work. With the evolution of digital technologies the importance of employee engagement is higher than it's ever been. Make your digital workplace a success. CX is a top priority. Emerging tech, changes in consumer needs and effective use of data are now business critical. Ensure your customer strategy is as competitive as possible. IoT, Edge Computing, AI - okay so they have been 'emerging' for years now but business transformation is truly understanding technology and improving processes, customer experience and business output. How can we properly harness all of these? How consumers interact with your business has changed. With that, traditional product development is out the window. A world class digital experience is expected, find out how leading Heads of Products go about this. Digital technology delivery ... and execution requires a new type of project management. Two thirds of digital products fail, we explore the pitfalls and successes to be had in delivery. Rub shoulders with some of the brightest digital business leaders across Europe. Historically the event has attracted delegates from across Europe and even stretching to the EMEA and APAC regions. Can't make both days but would like to hear some of the finest keynotes and attend the networking drinks? Ideal to hear some of the bigger keynotes and take value through full networking. Our busiest day. Includes breakfast, coffee breaks, lunch and networking drinks. Gain access to every track, every talk throughout the two day conference. Includes all talks, access to presentations, breakfast, coffee breaks, lunch both days and networking drinks on day one. By far our most popular ticket for attendees. Ideal for those looking to immerse themselves in a day of content but can't make day one, with more track content this is ideal for those looking to gain insights and also hear our brilliant day two keynotes. Includes breakfast, morning coffee break and lunch. "Incredibly impressive array of speakers and it's the perfect setup to drive collaboration. The agenda showcased some very interesting case studies with many key takeaways for our team"
"Really enjoyed the Digital Transformation conference. Well orchestrated and left me feeling energised to head back to work with new ideas and an action plan"
"A hugely engaging event with some almost surreal insights into innovations happening in the digital space right now"
We have a range of sponsorship packages for our events to suit a range of budgets and exposure options. With some of the biggest names in tech joining us our events attract a senior level audience who are interested in engaging with new tools and technologies to further their enterprise capabilities. We have packages to suit a variety of budgets and requirements. 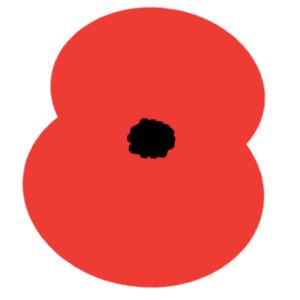 Sponsorship is becoming limited, enquire soon as we anticipate selling out soon. BOOK TICKETS & SAVE TODAY! 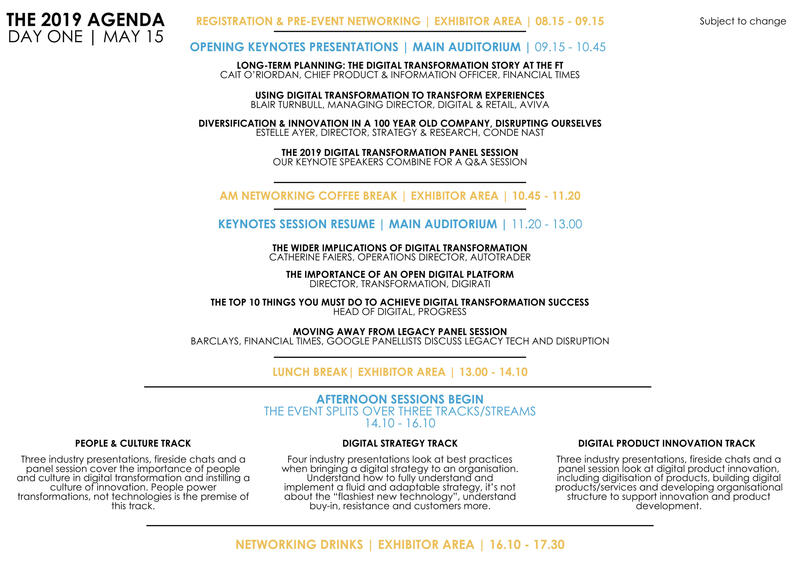 The Digital Transformation Conference is a Roar Media Ltd event. 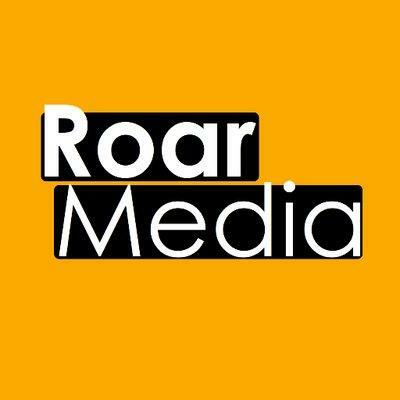 Roar Media have global experience in the technology events space, their focus now is on the digital and technology space bringing together the brightest minds in the space to come together and collaborate, inspiring the most innovative sector globally. The Digital Transformation Conference is now in its fourth year and has grown in size to become London's leading conference for digital businesses. Roar Media Ltd and ‘The Digital Transformation Conference’ helps business professionals (our Users and Event Attendees) find relevant content, improve their skills, find suppliers, build their knowledge, and stay up-to-date. 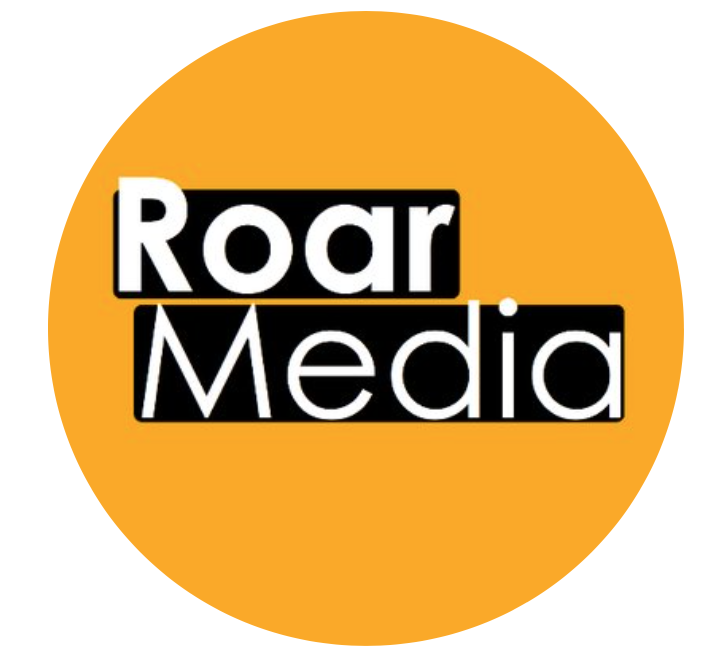 Roar Media Ltd and ‘The Digital Transformation Conference’ helps organisations (our Clients) share or syndicate business content online and at live events. Roar Media Ltd and ‘The Digital Transformation Conference’ helps organisations (our Clients) identify and contact business professionals who may have an interest in their products, services, expertise, or content. The service is provided exclusively for Users aged 18 years or older, on the basis that Users may access content, services, events, or other opportunities in return for sharing their personal data with our Clients (the sponsors or contributors), for marketing purposes. The Digital Transformation Conference website www.digitaltransformationconf.co.uk is operated by Roar Media Ltd (referred to here as “we”, “us”, or “Roar Media”). Content that you access (or otherwise interact with), your browser, screen resolution, device, browser, IP address, location, operating system, connection speed, searches you conduct, and when you open our messages or follow links within them. This is done through Google Analytics. Your preference and consent information, communication that we have (such as online chats, phone calls, letters, or emails), posts, uploads, comments, and other information you provide through forms, surveys, or other means. We do not collect special categories of personal data as defined by Article 9 of the EU GDPR. The Digital Transformation Conference or Roar Media services may redirect you to, or contain links to, third party websites or other digital properties. This policy does not govern the disclosure of any information by you to third parties. When you access content hosted on behalf of, or in association with third parties, your data may be shared with the contributor or sponsor, who may contact you for marketing purposes. As required by law, to comply with lawful requests or instructions from law enforcement agencies or courts with appropriate jurisdiction. Consent Where you have given your consent for a particular type of processing to take place (such as when joining our email list), we will process your data on that basis. We have a legitimate interest in processing your data to operate our websites inc www.roar-media.co.uk as a commercial service, and to provide marketing or advertising services to our Clients or partners or send targeted correspondence of interest. When we rely on this basis, we only process your data as necessary to achieve it, and we always consider and balance your interests, rights and freedoms against our own. We take all reasonable precautions to protect and secure any data that we hold about you from the point that it reaches us. We may retain your data for 7 years, or until you ask us to delete it. • Our clients - sponsors of the event. If you receive marketing, or other messages from us, each will carry an unsubscribe mechanism for you to easily opt out. Alternatively, you may contact us as detailed below. Right to be forgotten (Right of erasure) In certain circumstances, you have the right for your data to be forgotten. To exercise this right, you must contact us as detailed below, clearly stating your wish. We may need to verify your identity.